Of the numerous ceremonies and receptions that President Reuven Rivlin hosts for an incredible number and variety of organizations and institutions in Israel and abroad, the one closest to his heart was arguably the meeting of the International Board of Governors of the Hebrew University, which this year is celebrating the centennial of the laying of its 14 corner stones on the barren hills of Mount Scopus. Rivlin is not only a law graduate of the Hebrew University, but has an honorary doctorate from the university as well as a second-generation connection. His late father Prof. Yosef Yoel Rivlin began his academic career at the university in 1927, two years after it was officially opened – working initially as an assistant teacher, and moving through the ranks until he was finally appointed as a full professor. Yossi Gal, the university’s Vice President for External Relations, declared on Tuesday that the Hebrew University has a tradition for innovation and a signature for excellence. He then listed some of the achievements of its faculty and alumni, including their prize winnings: eight Nobel Prize laureates; 20 Wolf Prize laureates; 20 Emet laureates – including three more announced last week; 50 Rothschild Prize laureates; and 241 Israel Prize laureates – winning in every field in which the prize has been awarded. Most of the prize winners who are still living were grouped together in the front rows of the reception that was held on the lawns of the presidential complex. 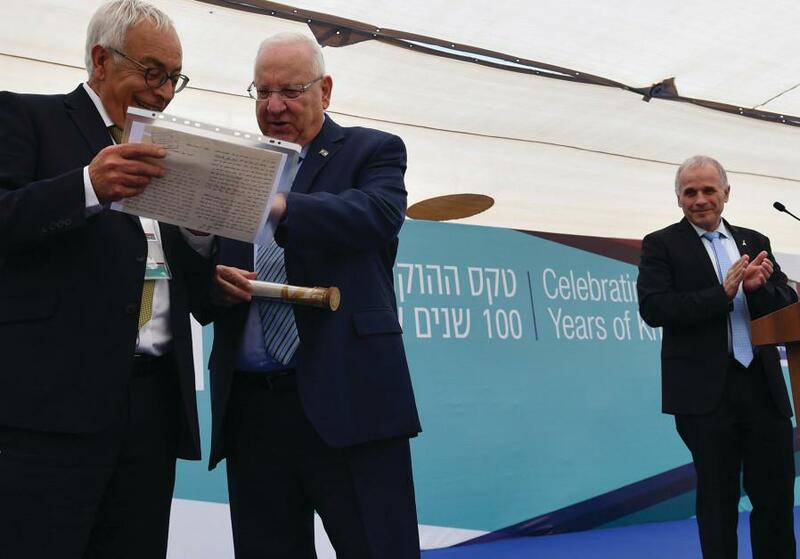 Acknowledging that their achievements were huge individual successes resulting from decades of hard work and creativity, Rivlin said that the Hebrew University was part of the support system from which their excellence grew. “We are proud of you and we are proud with you,” he said. He also declared the Hebrew University to have been “a huge step” towards the creation of the State of Israel, and a leading partner in creating not only a better Israel, but a better world. In the latter context, he listed many of the initiatives and discoveries of HU researchers which are helping agriculture, staving off hunger, enabling water management, curing disease and more. “You are an impact for good,” he said. He also credited the Hebrew University with turning Jerusalem into a university town like Cambridge and Oxford. Rivlin noted that not only have he and his father been connected to the university, but that his wife Nechama had worked there in the university libraries for close to 40 years.